Spandrel Development Partners is a multi-disciplined real estate development firm. The company is focused on developing mixed-use, multi-family, hospitality and retail projects in target cities of growth. From concept through construction, Spandrel leverages its principals’ decades of experience and relationships while bringing an ownership perspective to the development process that is focused on excellence and the creation of long-term value. Our proprietary analysis and results-oriented philosophy has helped us execute projects and establish a growing pipeline in the southeastern United States. Following our systematic study of high tech GDP, labor, wage and population growth, we continue to source and execute on new projects. 630 Indian Street is a mixed-use property with 275 units of multi-family rental apartments, 10,000 square feet of retail, and over 13,000 square feet of amenity space situated above structured parking. 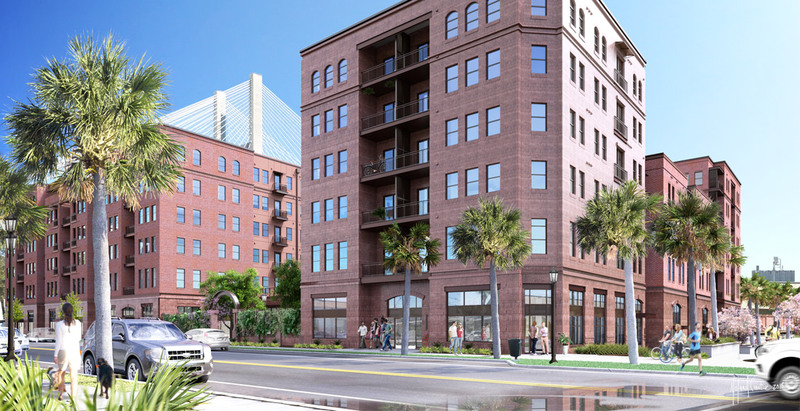 Located in Savannah’s Indian Street district, steps away from the Savannah River Walk and the high end boutiques and national retailers of Broughton Street, 630 Indian Street offers unique downtown living and access to it all. Our community shall offer expansive studio, one, and two bedroom homes. Amenities shall include: pool, outdoor fire pit, dog walk, indoor parking, fitness center, crafts space, co-working & media lounge, gourmet kitchen, two vegetated courtyards, and Savannah’s largest solar roof farm.